It’s the last roundup for the Hilltop Steak House. The landmark restaurant on Route 1 in Saugus, known for its juicy steaks, its giant cactus sign, and its herd of plastic cows, has announced that it will close later this month, citing a dramatic decline in business. The letter was signed “The Management of Hilltop Steakhouse” and sent to the attention of Selectmen Chairman Michael Serino. A mecca for beef lovers, the restaurant offers, among other things, an 18-ounce bone-in sirloin steak and 14-ounce servings of rib eye steak, boneless sirloin steak, and prime rib, according to its menu. 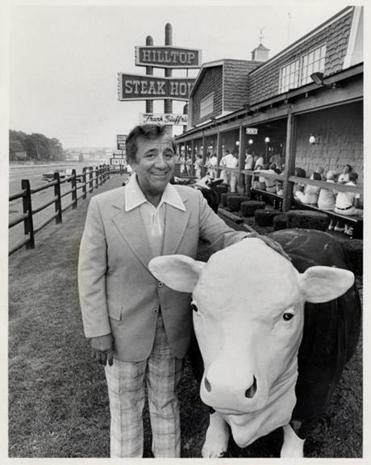 The owner of the Hilltop Steakhouse would much prefer that the people who work for him talk about his generosity. They are only too happy to oblige. Selectwoman Julie Mitchell said she heard the news this morning. One of Mitchell’s first jobs was being a hostess at the Hilltop, she said. Mitchell noted that the Hilltop isn’t just an important monument for Saugus, but that people from around the world have traveled to eat there. Mitchell thought that although general business had been declining, the use of Hilltop’s function rooms would help carry the business. The letter said the restaurant would close for the last time on Sunday, Oct. 20. The restaurant’s management and staff, with the help of the town, in recent years had made “tremendous efforts” to overcome the decline in business, the letter said. “In closing we would like to express our sincere gratitude to all the departments of the Town of Saugus and its wonderful residents for their support and patronage over the last 52 years,” the letter said. The company”s butcher shop in Weymouth will continue to operate, the letter said. A Braintree location closed in 2007. Globe correspondent Kara Baskin contributed to this report.